As part of our celebration of National Poetry Month, we're featuring a wide variety of poets and their works. Today's poet is Margaret Atwood! Born in 1939 in Ottawa, Ontario, Atwood earned her bachelor's degree from the University of Toronto and her master's degree from Harvard. Though perhaps best known today for her prose, Atwood's first publications were poetry. Her first collection, Double Persephone, published in 1961, won the E.J. Pratt medal, and her second, The Circle Game, won the Governor General's Award. These early volumes established themes and motifs that would continue to appear not only in her poetry, but her prose as well. Her poems tend to deal with the duality of existance, comparing the natural with the man-made, the imagined with reality, the internal with the external. Often characters unable to cope with that dual nature struggle with isolation and suffering, something that many readers find relatable. Atwood's poetry resonated with the feminist community in particular, though Atwood was, as she put it, profoundly apolitical when she first began writing. For her, the suffering of her female characters at the hands of the discriminatory systems around them was simply a depiction of the world as she saw it. “My women suffer because most of the women I talk to seem to have suffered,” Atwood told Judy Klemesrud in a New York Times interview. 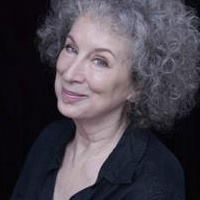 Today, Atwood is known for her dedication to both feminist and environmental causes, both topics found frequently in her poetry as well has her prose. In total, she has published more than 15 volumes of poetry and nearly 20 novels, as well as nonfiction books and essays, short stories, and even children's books. Her most recent collection of poetry is The Door, published in 2007, but her older works are receiving new attention thanks to the award-winning Hulu original series based on her bestselling novel The Handmaid's Tale.